This Friday, 20 March 2015, the moon will cast a shadow about 100 miles wide in which the Sun is obscured completely, and it will be partly covered over a much more extensive area. The event will be a total eclipse for those in the Faroe Islands and Svalbard, but only a partial eclipse for viewers in the UK. 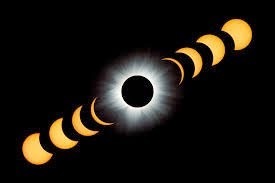 As well as being spectacular events, solar eclipses are also a good opportunity to do some valuable science because they allow observation of phenomena normally hidden or outshone by the Sun’s light. The solar corona – the Sun’s plasma outer atmosphere – is one such area for study. We normally can’t see the corona (at visible-light wavelengths) since the Sun’s light is too bright, but eclipses provide a chance to get a better look, and astronomers are set to descend on the Faroe Islands and Svalbard in the hope of getting more insight into why the corona is so much hotter than the Sun’s surface. 2015 also marks the centennial of Einstein’s Theory of General Relativity which was proven by Arthur Eddington during the 1919 eclipse. Arthur Eddington travelled to the island of Príncipe, off the west coast of Africa, where he took advantage of the solar eclipse to successfully test one of the predictions of Einstein’s general theory of relativity – that the path taken by light bends in a gravitational field, known as gravitational lensing. A number of eclipse-viewing parties across the UK will be taking place to observe the eclipse safely and learn more about astronomy as well as a nationwide live weather experiment organised by scientists at Reading University who are asking the general public to send in their observations of the changes in weather that will occur during the eclipse.